fossils in the world have been found in this region. 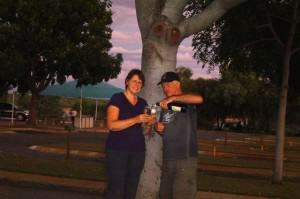 We arrived on a sunny, autumn morning and checked into the Lakeview Caravan Park ([star][star][star][star_half]). Overlooking the lake, of course, and situated beside the golf course, the park is located within easy walking distance of just about everything in town. We settled in to the park and with camp set up we decided to explore Richmond’s newest attraction. Lake Fred Tritton was awarded the National Best Overall Project and the Recreational Infrastructure Project in 2004. With a 1.2 kilometre (¾ mile) circumference and a maximum depth of 8 metres (26 feet), it is set up for all kinds of watersports from swimming and fishing to sailing, water skiing, and jet skis, and is surrounded by the Bush Tucker Garden, an area filled with native trees and shrubs. With picnic facilities, including free electric barbecues, a couple of jetties and a boardwalk, it’s the perfect place to spend a lazy day. After dark, a stroll around the walking track reveals the heavens in all their splendour, as the tourist brochures say, it is an absolute kaleidoscope of stars inthe brilliant outback sky. It was good for a laugh! 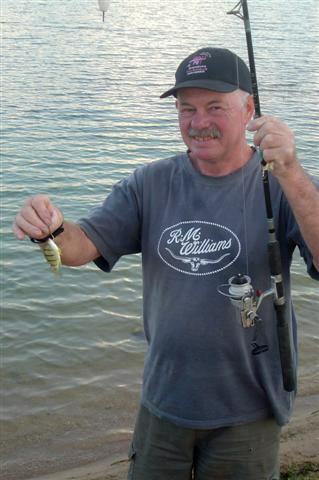 We’d been told that the lake was stocked with a variety of fish including barramundi, grunter, and yellow fin so John thought he might like to throw in a line and the result, while not the usual offering, at least gave us a good laugh. So I left John with his fishing rod and set off for a walk around the lake. There are sandy beaches and playground facilities and it’s obvious that all the awards this project garnered were well deserved. As the sun was setting we sat out under one of the beautiful old trees in the park and enjoyed our bottle of Two Tails Sparkling Wine to celebrate our first night in a new place. The sky was beautiful and I would have happily stayed all night if it had not been for the cool breeze that sprang up. 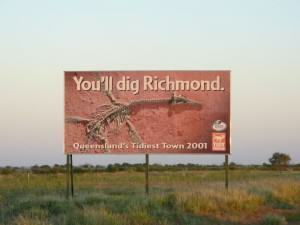 The next morning we set off for Kronosaurus Korner, Richmond’s museum dedicated to prehistoric marine reptiles. What a fascinating and interesting place this is. From the life-sized 12.2-metre (40-foot) replica of Kronosaurus Queenslandicus that greets you out front to the 400 exhibits dating back to the Cretaceous period between 98 and 114 million years ago, the museum will keep you enthralled and quite possibly infect you with “fossil fever” for which the only cure is to pick up a map from the reception desk and head on out to one of the region’s designated fossicking sites. It’s hard to imagine a time when dinosaurs roamed here. 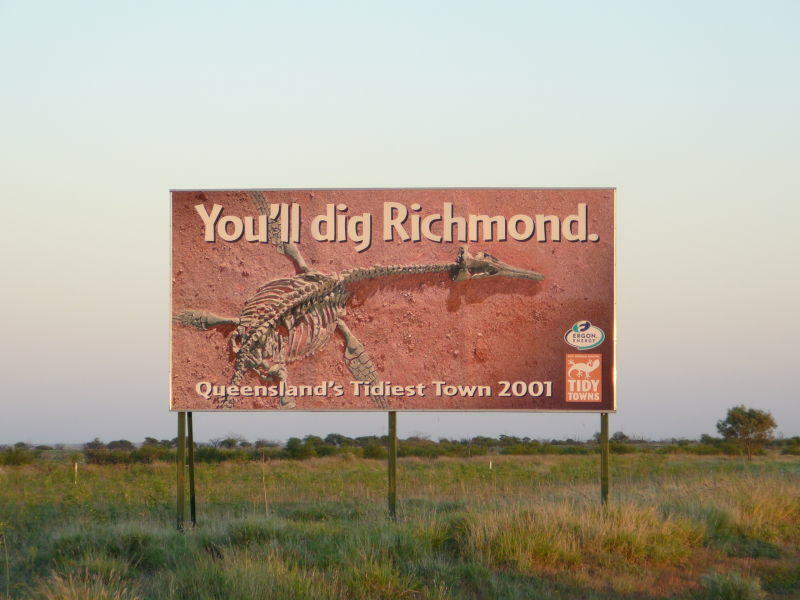 Today, Richmond is 500 kilometres (310 miles) from the sea but one hundred million years ago it was a seaside holiday resort for dinosaurs. A remarkable number of fossils of marine creatures have been found in this area, including the world’s only complete 4.25 metre (14 feet) skeleton of a pliosaur discovered in 1989, and the remarkably intact and complete fossil of Minmi, an armoured dinosaur known as an ankylosaur. Both of these are around one hundred million years old. 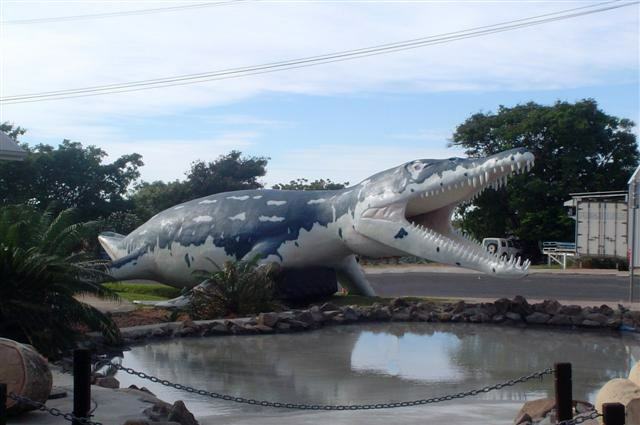 There are fossilised remains of the Kronosaurus Queenslandicus, the biggest and most savage marine reptile ever discovered; it would even go after an allosaurus, cousin to T-Rex. One of the exhibits shows the fossilised tip of Kronosaurus’ snout. At 54 centimetres (21 inches), this fragment is only the very tip of the snout, in front of the nostrils. 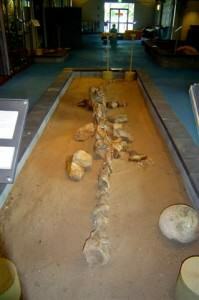 The complete skull would be more than 2 metres (6½ feet) long. This thing could make those big crocodiles we saw in Darwin run away and hide! It’s amazing what they farm here! The displays offered personalised commentary and it was through this that we learned about the discovery of the pliosaur. Found by a farmer in 1989, at first it was believed that there were only a few bone fragments but it soon came to light that what he had indeed found was the complete skeleton. Scientists believe that the pliosaur’s body sank to the bottom of the sea shortly after death and that being submerged helped to preserve the skeleton. named for the unique rocks found in the Richmond shire. Moon Rocks are limestone creations and can vary in size from a golf ball to something weighing several tonnes. There are quite a lot of them placed around the lake. Some of these rocks have been found with fossilised remnants of fish, foliage, and shells imbedded in them. We wandered around the town for a while after leaving the museum. 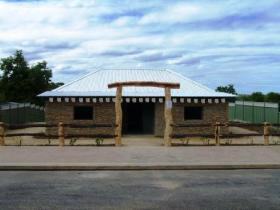 Along the main road is the Cambridge Downs Heritage Display Centre, a replica of an 1860 homestead constructed from local flagstone rock. The original house was built in the 1880’s. Explorers first travelled through this area in 1862 but it wasn’t until the gold rush of the 1880’s that Richmond was born. The town began its existence as a way-point for Cobb & Co Coaches. Today it has a population of about 800 permanent residents and literally thousands of tourists stop here every year using the town as a base for exploring the Dinosaur Trail. Of all the hundreds and possibly thousands of dinosaurs that roamed here only a handful of fossils have been found and it is widely believed that there are still a lot out there. So, what are you waiting for? Go get that map and get out to a fossicking site. Who knows, you just might unearth another dinosaur!